Back home I cut them all up into strips with my rotary cutter. 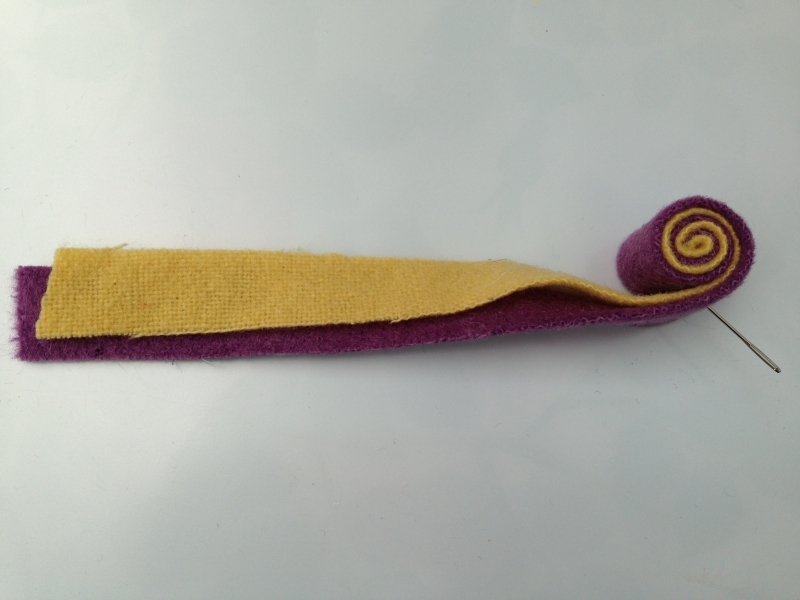 Then the fun bit: First lay two different coloured strips on top on one another and begin to curl them up between your fingers keeping the initial fold as tight as you can. It’s quite easy to roll them up but you do need to keep tight hold or else they flirt open and leap onto the floor! I kept mine from uncurling by sewing them through the middle using sock wool with a very long needle. Mine is a called a Doll needle and there were 3 in a packet, I find the 5inch one easiest. It was very hard to pull the needle right out of the other side of the roll without using a needle grabber. Once I bought the grabber it was very straight forward. If you were making these to combine for a rug or item to be used you should sew them together with linen thread for strength. 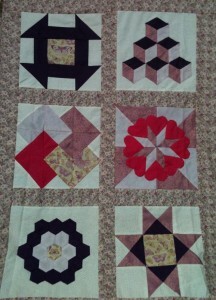 Here are the finished ones grouped together but not sewn together. I wanted to experiment with the colours. I haven’t decided if this will be the final colour layout but I will add more quillies as soon as I cut more strips from my store of felted charity shop jumpers! 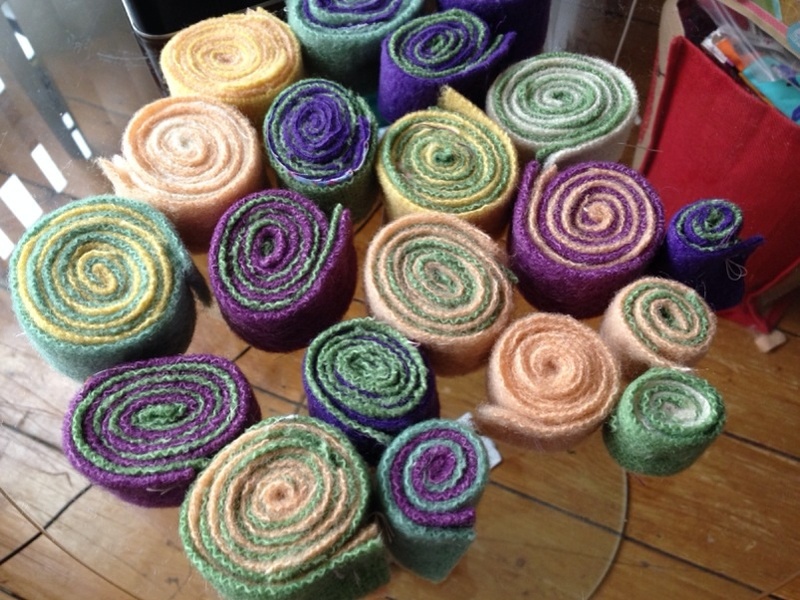 I could sew these together and then add to the rug so it grows like freeform crochet or I could wait until I have all my quillie rolls and create the design first. Decisions! 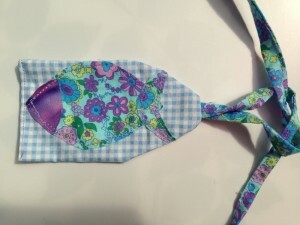 The sewing up part involves sewing two together – straight through the middle of each in a couple of places, then adding another one and sewing it to the first two in what ever shape you want. 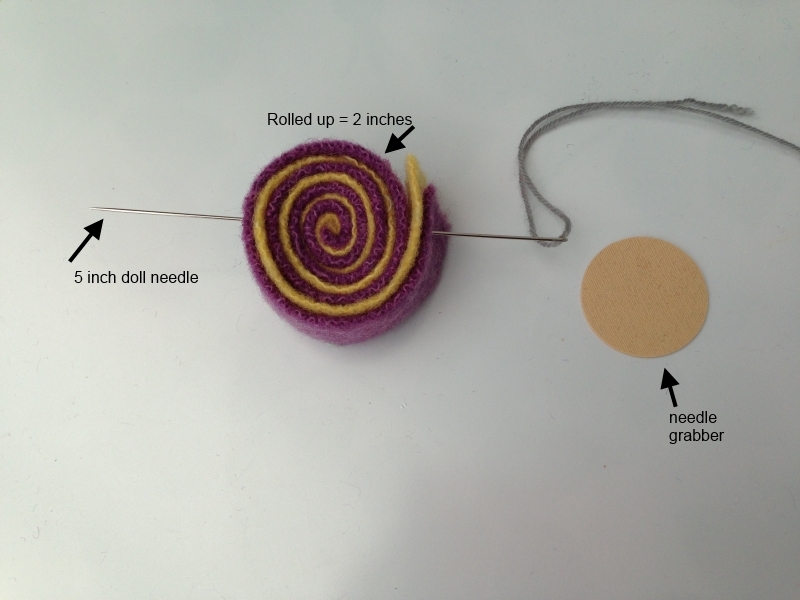 Each quillie needs to have several strands of wool, or preferably strong linen thread, holding it to the others around it, using the long needle, and then needs to be sewn at the top edge to the adjacent quillie, using a curved needle. 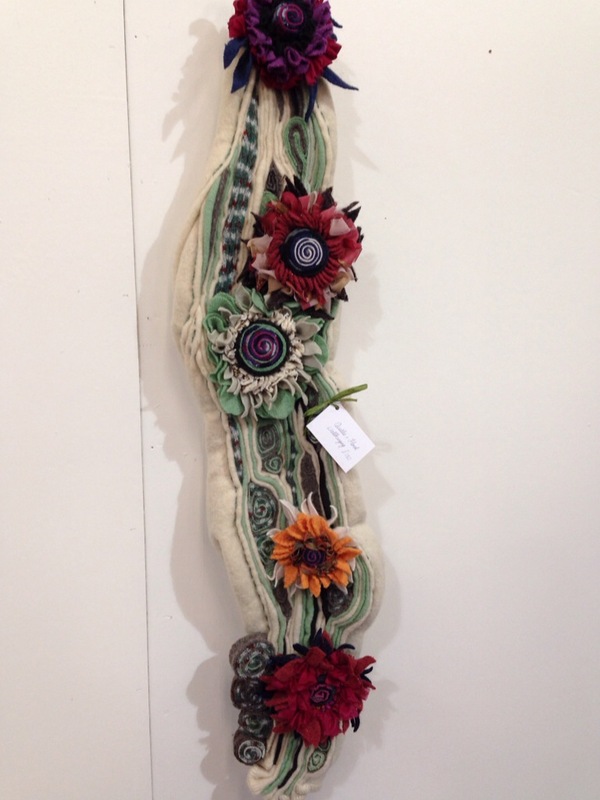 I imagine this is to make it secure enough to be walked on unless you wanted to have it as a wall hanging. They could also be made into place mats though which would be much quicker! My largest quillies are about 3inches in diameter, the ones in the picture are 2 inches. 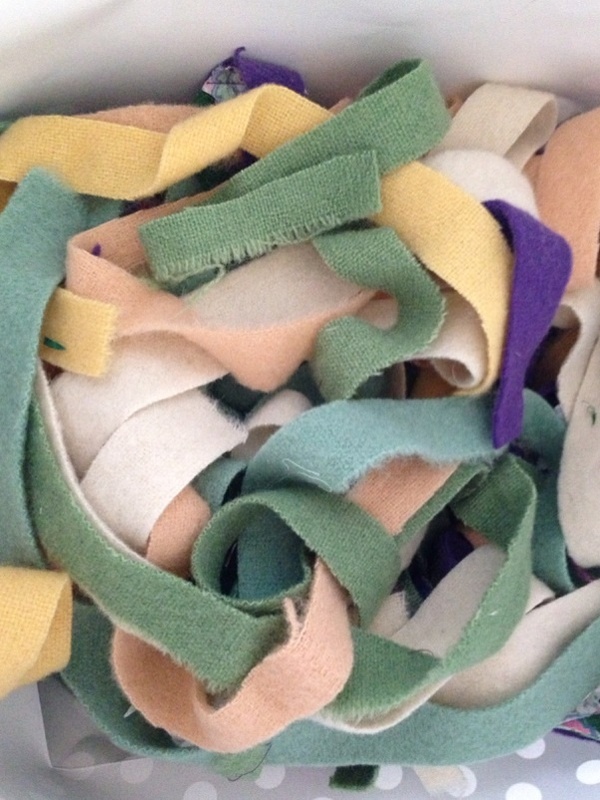 You just roll up the strips till you have the size you want then cut off the rest! Hopefully next week I will be able to post a complete rug! 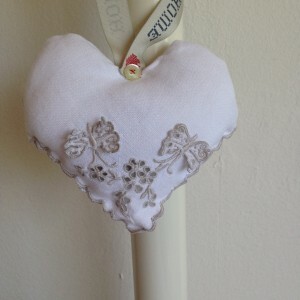 Linking up with Handmade Monday now and off to see what everyone else has been making! 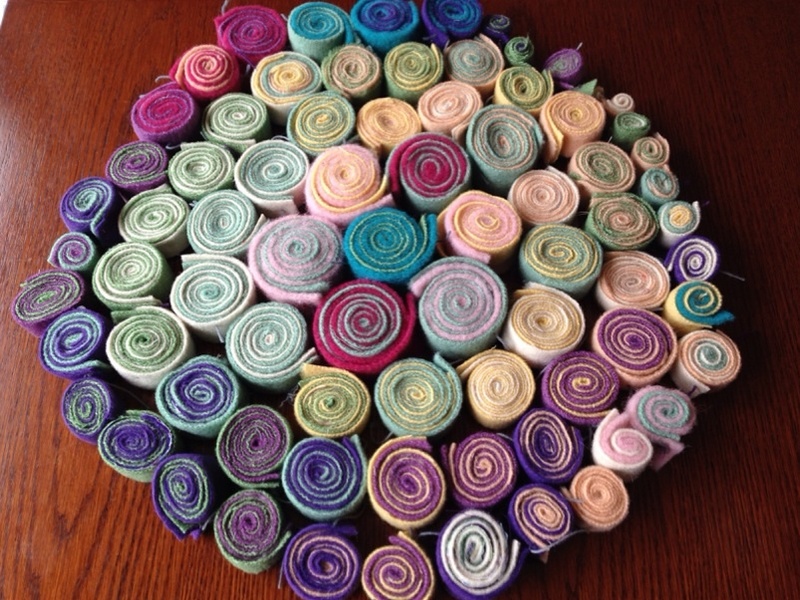 Birthday Weekend and Wonderwool 2014! 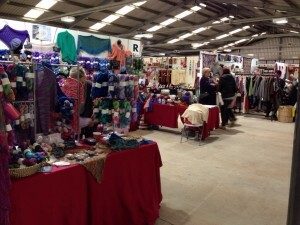 Well one year one it’s my birthday weekend again and I’m back in mid Wales for Wonderwool. I loved this place last year and this year I have enjoyed it all over again although it’s never quite as good the second time around! It’s full of lovely, tactile, woolly goodness, intricate tools to make things with and unusual and individual clothing! We arrived on Saturday and stayed in the same B&B as last year – Guidfa House at Crossgates, Llandridnod Wells. This is a very warm, comfy place to stay and the hosts, Tony and Ann are very friendly and helpful. We were given tea and date and walnut cake on arrival which we enjoyed in the peaceful guests’ lounge. Our room had 2 comfy chairs and coffee table – something that I always appreciate in hotel rooms as I don’t like having to sit on the bed all night. Oh the joy of relaxing by the window, looking over at the hills while doing my crochet, watching TV and drinking a glass of wine…, wait …actually that’s a pretty standard Saturday night for me … albeit without rolling hillside for a view!! Oh well I do know how to enjoy myself anywhere!! Early this morning we arrived at the Royal Welsh Showground and there was plenty of parking and it was not too crowded inside at all, though with lots to see and buy and lots of people showcasing their crafts – I love watching the spinners, in fact last year I really wanted to buy a wheel and go on a spinning course and I just realised it’s a year ago and I still haven’t learnt to spin! It’s actually quite similar to Yarndale but more spread out and much easier to see what’s on offer as the stalls are in bigger spaces and more spread out. 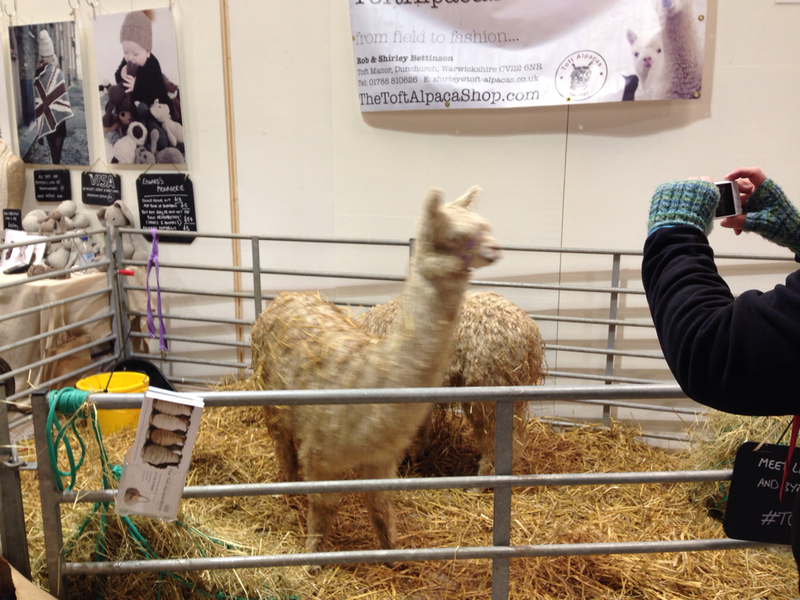 There are also live sheep, lamas and angora rabbits! 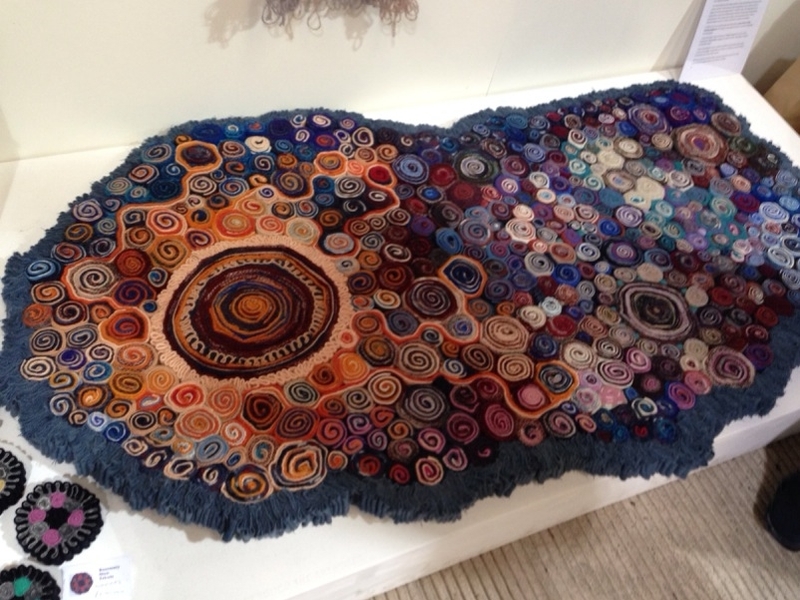 I did really love this rug below though and this wall hanging, both by Gill Curwen of Bapple and Jo Jo – It’s a craft called ‘Quillie’ which is sort of rolling felted wool strips cut from blankets or clothes into Swiss Roll shapes and then sewing them together to make mats and rugs in beautiful shapes and toning shades. I am looking forward to perusing her website now I’m back home! I was talking to my daughter about Wonderwool before I went and she asked what her dad was going to do while I was engrossed in the woolly world I told her he follows me round then goes and reads his book in the cafe area – she said there should be a ”long suffering partners’ ” area with comfy seats, internet access and various reading material! Wouldn’t that be good?!! 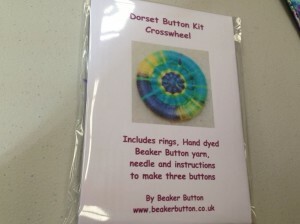 I didn’t spend too much at all – just some felted wool and this handmade button kit from Beaker Button, which once you’ve learnt how to do it you can upscale it and make giant hangings in embroidery hoops and even hula hoops! 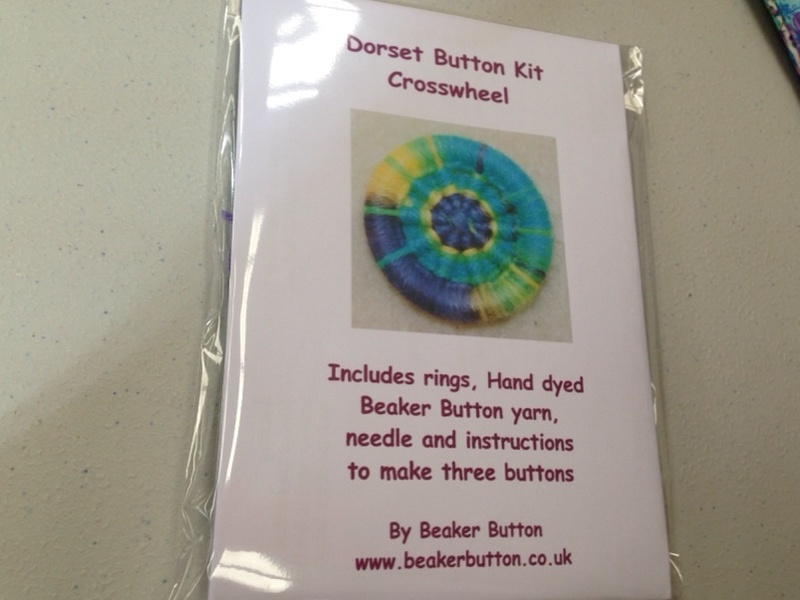 The information in the kit explains that Dorset button making was a huge cottage industry from the 1600s until the Great Exhibition of 1851 when a new button making machine was showcased. Families were left destitute and starving and many were forced to emigrate! It is the WI and others now keeping this craft alive – I am happy to become one of them! Wonder if I’ll spend next birthday at Wonderwool? Over to some other wonders now – at Handmade Monday! 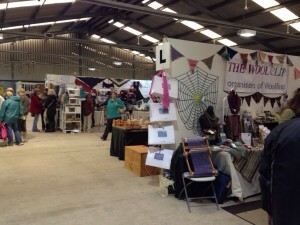 Wonderwool Weekend in Wales Yippee! What a lovely birthday weekend, DH agreed to go to Wonderwool Wales with me! We set off Friday night to Llandridnod Wells and found we had been upgraded to a suite from a double room – big comfy bed and our own little sitting area with couches, TV, DVD player and music centre!It was so relaxing after our drive – we had a jacuzzi bath as well – so we relaxed in comfort with a nice bottle of birthday wine while I planned how to enjoy the next two days! Saturday we browsed round the book shops and the vintage shops in Hay on Wye. There was a lot of vintage lace and embroidered cloth in one place which wasn’t for me but would have been a fab find for someone! We also managed to find a coffee shop with home made cakes and another with home baked Cornish pasties! Oh I do know how to enjoy myself!! Anyway, on Sunday after a very satisfying brekkie, we arrived at Wonderwool just after it opened. It was already bustling and there was some very unique and interesting clothing – and that was just the customers! Weird and wacky outfits- knitted, crocheted, felted, sewn or spun – it was either for sale or being worn by a customer or stallholder! If you love wool you should really make time to visit one of these shows. There were lots of balls or hanks of ready to use wool and even more piles upon piles of wool tops for spinning. You could get plain (raw?) wool tops or some that was already dyed. 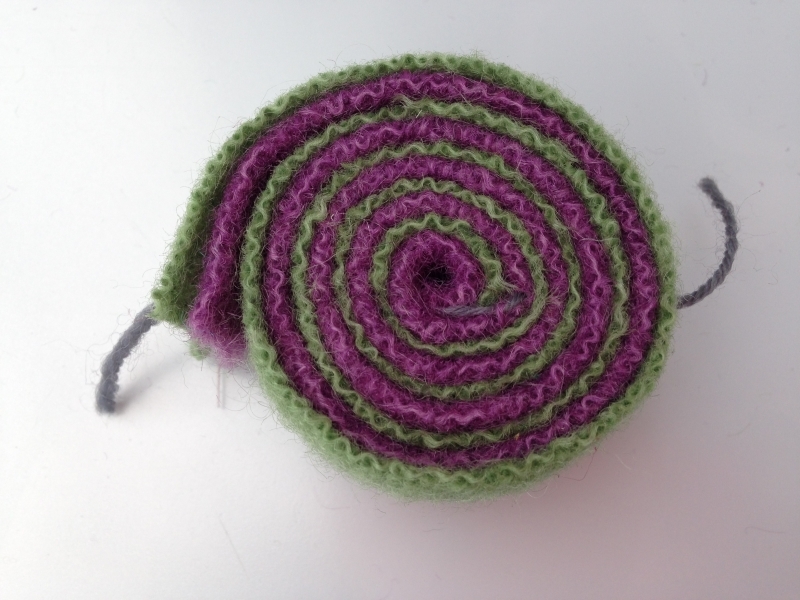 Some of the colours were enchanting, I watched a demonstration of how to blend wool rovings into a swirly mix of purply pinky loveliness! Up till now knitting and crochet have been my thing but what really inspired me today was the art of spinning with a wheel. I would very much have liked to have bought a wheel right there and then and sort out how to use it afterwards! However, I managed to be sensible and resist and instead listened to the advice of a lady in the Spinners and Weavers Guild who suggested learning how to use one first and trying some out before buying, then looking on eBay once I knew what type suited me. 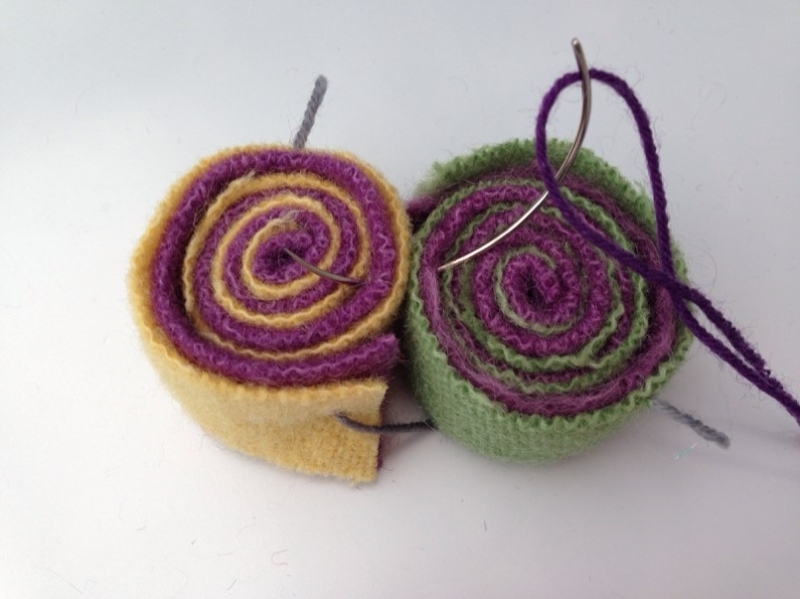 She also told me some Guilds lend out Spinning Wheels to members for as little as £5 a month and that would be a great way to find out if Spinning is something I will continue to enjoy doing. 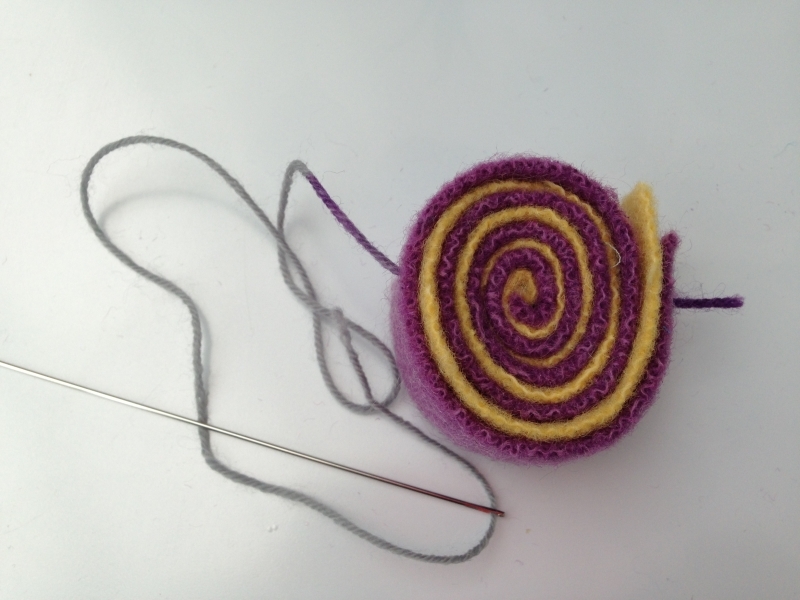 My mission now is to suss out a spinning workshop or course which is within reasonable travelling distance of Wirral or somewhere with accommodation (little spinning holiday!!) If anyone else fancies learning and is near enough to split traveling costs I’d love to hear from you! 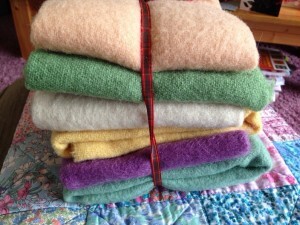 A pack of dyed felt with some orange and turquoise pieces to make some additions to the sewing bag I started last week. 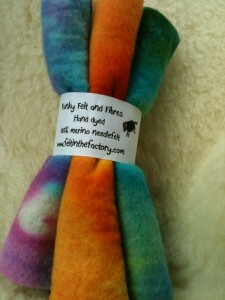 The felt is on one of the lambs wool pieces. 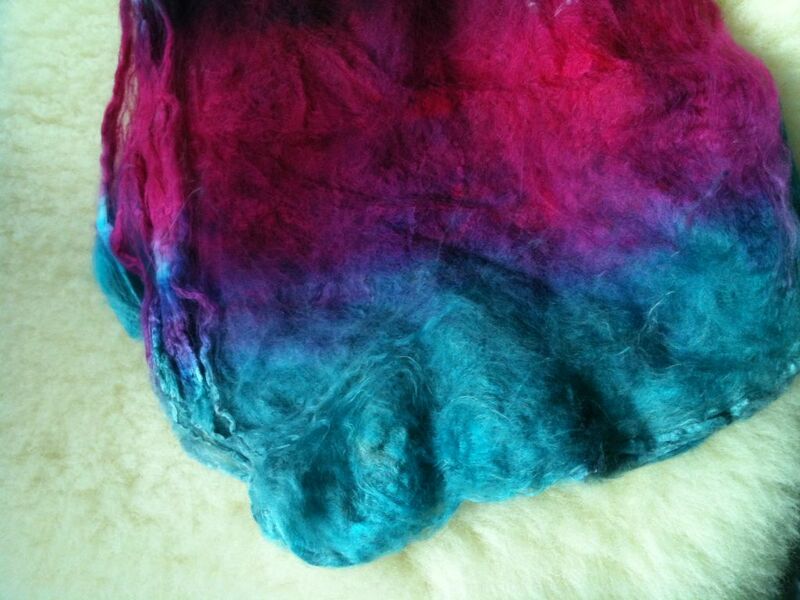 These dyed silk hankies – not sure for what yet – I just love the colours. Over now to Handmade Monday – see what you have all been up to!